What are the Main Sources of Air Pollution? Provided is the information the ACRD has as of Aug 7, 2018. We anticipate that changes may occur in regulations as they are developed at the Provincial and Federal levels. On July 25, 2018 the ACRD Board of Directors adopted a Non-Medical Cannabis (NMC) Retail Store Licence Application Review Policy. A regime for medical cannabis is already established under federal legislation and through legal interpretations of the Charter of Rights and Freedoms. The ACRD adopted a zoning amendment in July 2014 to regulate the production of medical cannabis in our area. The Federal Cannabis Act will create a legal framework controlling the production, distribution, sale and possession of cannabis. The Cannabis Act received Royal Ascent on June 21, 2018 and comes into effect October 17, 2018. The Province of British Columbia has introduced the Cannabis Distribution Act (CDA) to establish a wholesale distribution monopoly and public (government run) retail sales, both in store and online. The second related piece of provincial legislation is the Cannabis Control and Licensing Act (CCLA) which will set 19 as a minimum age for possesion, allow adults to possess up to 30 grams, prohibit smoking where tobacco smoking is prohibited, prohibit cannabis use on school properties and in vehicles, allow up to four cannabis plants per household, establish a retail licensing regime similar to the current regime for liquor (this will allow for private retail), provide enforcement authority to deal with illegal sales, and where necessary to comply with Charter Rights, allow exemptions to individuals who are federally authorized to purchase, possess and consume medical cannabis. From the Province of British Columbia's BC Cannabis Private Retail Licensing Guide, "The Province will permit Local Governments to decide whether they wish to have a non-medical cannabis retail store in their community. For the Province to issue a licence, applicants must have the support of the local government in the community where the store would be located." Prior to providing a resolution supporting a specific NMC retail store referral, a local government must gather the views of residents. If a local government makes a recommendation to deny a specific NMC retail store application, the Liquor and Cannabis Regulation Board (LCRB) may not issue a licence. If a local government makes a recommendation to support a specific NMC retail store application, the LCRB has discretion whether or not to issue the licence, but must consider the local government's recommendation. 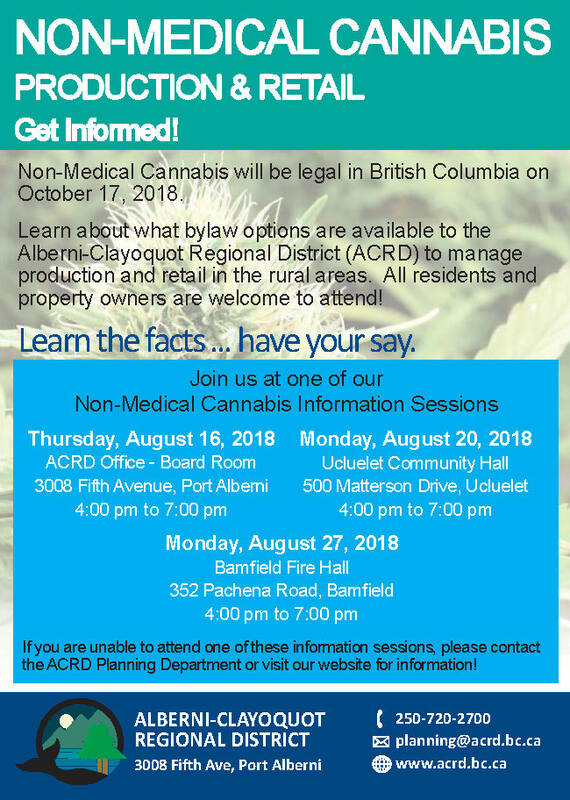 Local Government - The ACRD zoning bylaw regulates use, this includes cannabis retail stores when NMC becomes legal on October 17, 2018. The LCRB will refer applications to the ACRD. The application process is currently being implemented and the LCRB will begin processing applications prior to October 17. In all likelihood, the ACRD will receive referrals for NMC retail stores in August and September. If this policy is adopted, the Board would make a decision based on the evaluation criteria in section 3.3 of the draft policy. The way the policy is written, NMC retail would be supportable under certain conditions in the following "commercial" zones: C1, C2 and C2A. Bylaw P1380 was given first reading on July 25, 2018. This bylaw will amend the zoning bylaw to include the regulation of the production of non-medical cannabis. The intent is to match the regulations we already have in place for the production of medical cannabis. A new definition for "non-medical cannabis production" will also be introduced. Non-medical cannabis production would be permitted in the A1, A2, A3 Districts on lots with a minimum lot size of 6 acres and in the M1 District on lots with a minimum lot size of 4 acres. NMC production would be located a minimum of 100 feet from all lot lines. The Zoning Bylaw defines Medical Marihuana Facilities as "a building or structure, approved and licensed by Health Canada, for the production, growing and incidental processing of medical marihuana, but specifically excluding storefront or retail outlet distribution of medical marihuana." Medical Marihuana Facilities are permitted in the A1, A2 and A3 Districts on properties a minimum of 6 acres in size and in buildings located a minimum of 100 feet from all lot lines. Facilities are also permitted in the M1 District on properties 4 acres in size with the same 100 foot setback. Retail sales are not permitted. The Regional District has the authority to regulate the growing and incidental processing of non-medical cannabis through zoning. There are limitations to the Regional District's authority where the production of NMC is located on land within the Agricultural Land Reserve. Agricultural Land Reserve: Since May 2015, the production of medical marihuana has been designated as "farm use" which could not be prohibited by a local government bylaw where located on land within the Agricultural Land Reserve (ALR). Local governments must continue to allow NMC production where the cannabis is grown in a way that preserves the productive capacity of agricultural land. The regulation clarifies that cannabis production in the ALR cannot be prohibited if grown lawfully in an open field, in a structure with a soil base, in a structure that was under construction prior to July 13, 2018 or in a licensed facility.